Jimmy Ferris may seem arrogant and rude at first glance, but he is far more complex and intriguing, as Lena soon finds out. 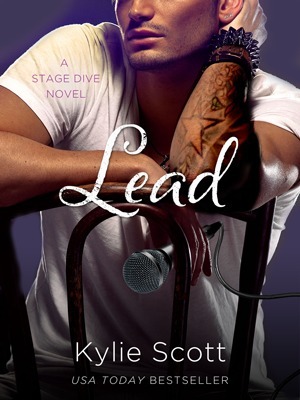 The third novel in the Stage Dive series features the lead singer, former alcoholic and drug addict and all around jerk, Jimmy Ferris. Lena Morrisey has the task of keeping him clean and sober. If Jimmy seems like the sort of a guy who lets no one tell him what to do, Lena is certainly the sort of a woman who can change that. It shows pretty fast into their ‘business arrangement’ that he can’t help but accept her help with her smartass comments, her pugnacity and gentle intelligence. They are an unlikely pair, but turn out to be surprisingly similar and compatible. Lead is not as laugh-out-loud funny as Play since Jimmy is a far darker character than Mal, but this infuses the story with a delicious sort of tension. It’s not just the conflicts between Jimmy and Lena and her growing feelings for him that draw the reader, it’s also that as a spectator you’ll root for Jimmy to find his peace and to cope with all the pain and self-loathing. Lena, of course, is just the feisty girl that can help him with it. Due to the complex situation between Jimmy and Lena, the first love scenes appear only well into the second half of the novel, but they are that much more in character and fantastic. Despite the way they come to happen, they don’t feel forced. Besides, they lead to the major conflict at the end, leaving the protagonists heartbroken, and the reader hungry for a happy resolution. What made this novel less good than Play was the ending. Seeing what a dark, troubled character Jimmy is, I had difficulty envisioning an ecstatically happy ending for him and Lena, so the conclusion felt a bit rushed. Maybe with a slower finish, a longer build-up to it, it would have felt more believable. I was also bothered by the number of typos that appeared throughout the novel; they were quite distracting. With Lead offering another sinfully delicious insight into the world of Stage Dive, I now eagerly await big boy Ben’s story, Deep.